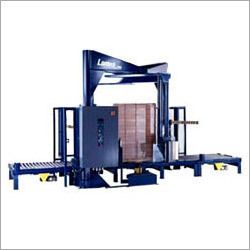 Based in Chennai, India, we Durapak are into the domain of manufacturing Overhead Straddle Wrapping Machines that are offered in various types, at competitive prices. Being the reliable 'Overhead Straddle Wrapping Machines' manufacturer, supplier and exporter, we have identified all the factors that may impact the machine's efficiency prominently. This has enabled us to produce these Straddle Wrapping Machines with a turn-table system, which makes the machinery ideal for tall/unstable loads, and light weight loads. Our Stretch Wrap Machines are used in environments that include corrosive products, and liquid spillage. The machines have lower downtime, which contributes to its higher efficiency and easy upkeep. Our equipment have least chance of breakdown, as we have used latest tools, and parts, components in its manufacture. Copyright © 2019-20 by DURAPAK All Rights Reserved.